The Big Picture: The Membership Principle: Amazon has surpassed 100 million Prime members globally. Those are members, not subscribers. Members don't just use a product, they live in a universe. They pay to join, pay to use and constantly supply data that informs and improves the product. Prime members aren't fans, they're season ticket holders. Amazon brought in $9.72 billion in revenue from them last year alone. What's Next: Jamie Dimon on Jeff Bezos for the new Time 100 List: "From the outset, the key to Jeff Bezos' success has been his intense and unwavering focus on customer satisfaction and on his audience: the end user. ... Jeff's relentless attention to consumers is not defined by any boundaries. As Amazon has grown ... he has never lost sight of the millions of people he is serving. And that is how you win in American business and raise the standards of what customers come to expect." Good morning. The Talk of Tinseltown: Amazon Studios is moving to the historic Culver Studios compound in Culver City, home to "Citizen Kane," "Gone With the Wind," "Raging Bull" and "E.T." NYT's Brooks Barnes says Amazon's move "demonstrates the degree to which the tech giants have woven themselves into the fabric of Hollywood. You can no longer separate one from the other." Why do you think we started PACIFIC? • Size: 560,000 employees, 2 million sellers. 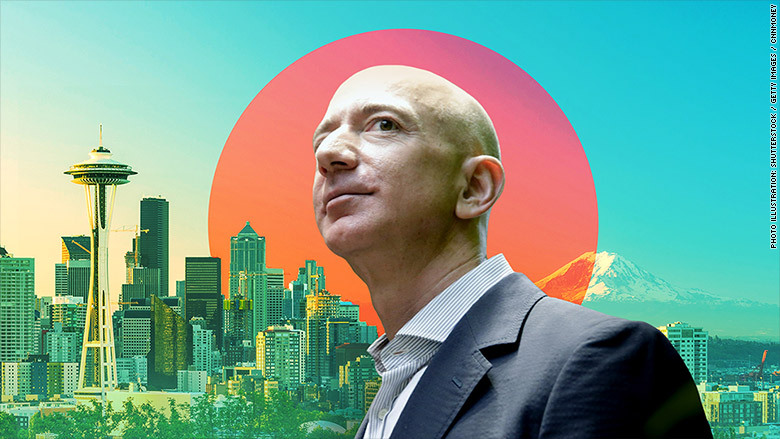 • Salary: The average Amazon Seattle HQ employee makes more than $100,000 a year. The median salary for its worldwide workforce is $28,446. • Prime: 5 billion+ items shipped with Prime worldwide in 2017. • Amazon Web Services: "A $20 billion revenue run rate business." • Amazon devices: "Tens of millions of Echo devices" sold in 2017. • Prime Video: "Rights for more than 3,000 feature films" in 2017. • Amazon Music: "Tens of millions of paid customers." • Whole Foods: No specific numbers. • Amazon Go: No specific numbers. • India: "Amazon.in is the fastest growing marketplace in India, and the most visited site on both desktop and mobile, according to comScore and SimilarWeb." • NFL Thursday Night Football on Prime Video had more than 18 million total viewers over 11 games. ... New this morning: Amazon Prime has secured exclusive TV rights to the US Open in the UK and Ireland for five years. • Trade "still relies on millions and millions of paper documents.... That last throwback to 19th century trade is about to fall." • "The key ... is blockchain, the electronic ledger system that allows transactions to be verified autonomously." • "The prize is a revolution in world trade on a scale not seen since the move to standard containers in the 1960s -- a change that ushered in the age of globalization." • "Documentation that takes days will eventually be done in minutes, much of it without the need for human input." • "The cost of moving goods across continents could drop dramatically, adding fresh impetus to relocate manufacturing or source materials and goods from overseas." • "Improving communications and border administration using blockchain could generate an additional $1 trillion in global trade, according to the World Economic Forum." • Dara Khosrowshahi saw Uber as "a sophisticated tech company that had taken on too much, too quickly, and whose systems groaned under the weight and confusion. Growth, not quality, had been its guiding principle for too long." • "Khosrowshahi would rather go at a pace slow enough to hit perfection than tolerate pretty good. ... [He has stressed] the importance of one metric: the ratio of driver or rider complaints to rides booked." • Khosrowshahi's strategy "offers a steady reassurance, but his deliberate pace has made some people uncomfortable." • "Among the product teams, in particular, there's still some question about his acuity. Though he has a degree in electrical engineering, he's a business guy." • "One former executive told [Hempel] that there were many people 'carefully watching whether Dara can step into and excel in the role of product leader and visionary." • "The social media company is seeking to hire a manager to build an 'end-to-end SoC/ASIC, firmware and driver development organization,' according to a job listing on its corporate website ..."
• "Facebook could use such chips to power hardware devices, artificial intelligence software and servers in its data centers. ... Future generations of [Facebook] devices [like VR headsets and home speakers] could be improved by custom chipsets." • "Apple started shipping its own chips [in 2010] and now uses them across many of its major product lines. Alphabet's Google has developed its own artificial intelligence chip as well." The Big Picture: In-house chips provide an essential edge for companies racing to pioneer new AI technologies. The latest from DOJ vs. AT&T: Time Warner CEO Jeff Bewkes cited "tectonic changes" in media brought on by Amazon and Netflix to make the case for AT&T's $85.4 billion acquisition of his company. • "Bewkes depicted Time Warner as a company that is quickly losing ground to tech giants [that] are swallowing up an ever-growing share of advertising dollars that used to go to television programmers." • "Bewkes said the likes of Google, Facebook and Amazon are able to exploit their technological supremacy to gain information on Time Warner's own customers that even Time Warner doesn't have." • "'They can offer more effective choices. They can recommended programming based on what you watch. They can sell you a better package,' Bewkes said. 'They have a lot of advantages.'" The Big Picture: If you accept the premise that media and tech are now inextricably in the same business -- and we hope six weeks of PACIFIC has convinced you that they are -- than everything Bewkes is saying is irrefutable. Whether that justifies the merger, or proves that it would not violate antitrust law, is a question for Judge Leon. What's Next: AT&T CEO Randall Stephenson takes the stand today. New SEC filings show that Comcast's offer for 21st Century Fox was 16% higher than Disney's $52.4 billion offer. • "Disney and Fox said the ongoing antitrust scrutiny of [AT&T-Time Warner] heightened concerns about potential regulatory hurdles to Comcast's bid." • "Unlike Disney, Comcast declined to offer a reverse deal termination fee, which would compensate Fox in the event that regulators stymied a deal. Disney offered a reverse termination fee of $2.5 billion." • "The companies also said that Fox saw Disney's stock as more valuable than Comcast's, based on historic prices, and felt that a deal between Disney and Fox would generate greater long-term value." The Warriors are in San Antonio tonight for Game 3. 6:30 on TNT. The Good News: The Warriors could sweep this series, easy. Then, it looks like they may face the New Orleans Pelicans, who lead Portland 2-0. The Bad News: Spurs coach Gregg Popovich, a legend in his own time, has lost his wife to an extended illness at age 67. Kevin Durant: "I want Pop to know that the whole NBA family is supporting him and got his back through it all. It's bigger than the game. It's bigger than winning and losing. It's about the brotherhood we've built with the NBA family." Tonight's other games: 76ers at Heat (4:00 p.m. on TNT); Trailblazers at Pelicans (6:00 p.m. on NBA TV). • "Kevin Durant isn't just an incredible basketball player; he's an incredible human too." • "As an entrepreneur, KD brings the same relentless work ethic and pursuit of excellence that he has on the court, focusing on companies and products that are making lives better." • "Above all, he has ridden the ups and downs of following his heart, making a hard choice and taking control of his own career—and has emerged wiser, happier, with his head held high. He's a role model for us all." What Next: Harper's Bazaar: Maye Musk, CoverGirl model, dietician, and mother of Tesla founder Elon Musk, chats with Esther Wojcicki, mother of YouTube CEO Susan Wojcicki, about life in their 70s, raising trailblazing children, and moving to Mars.